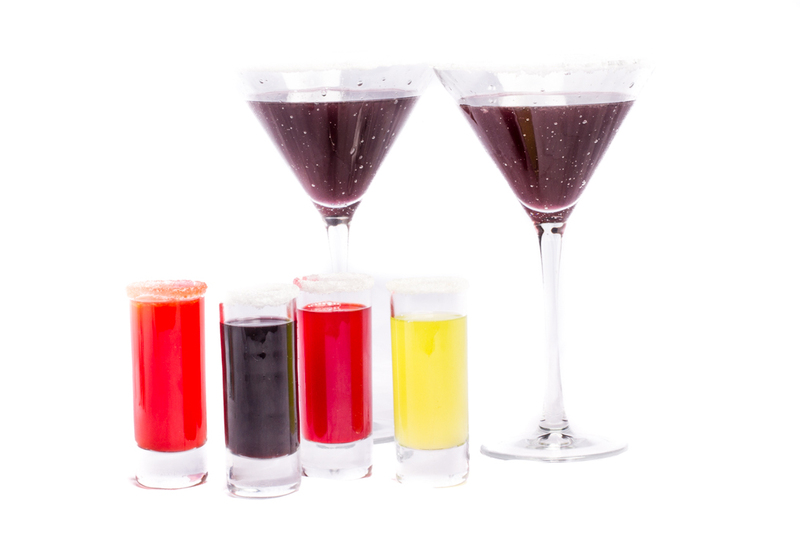 Shaken or strained strong drinks made from juices, syrups, and infusions. Served hot or cold, spicy or sweet. 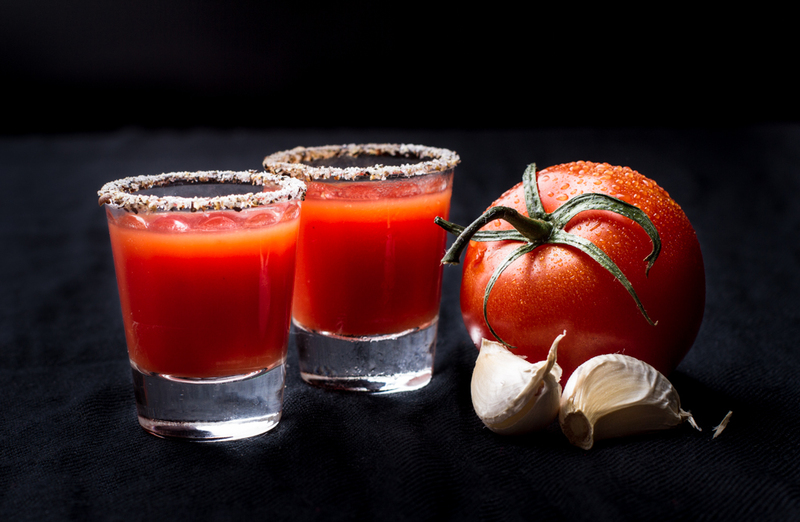 Gazpatcho Shooter – spicy, herbal and full of flavour. Earlier on this year my youngest daughter and I were inventing a Dragon’s Breath Shooter. My original idea was to use jalapeño peppers, limes and tomato juice. The Dragon’s Breath Shooter title was given to the best drink of a series of 5 choices, one tomato based and the rest fruit based, all with habanero pepper jelly as the heat. The tomato based concoction did not pass the muster for the halloween inspired shooters I was going for, as my sister-in-law turned her nose up at the smell. “Like spaghetti sauce” was my nieces comment, but she enjoyed the taste and asked me to keep the recipe. Put first four ingredients into cocktail glass and muddle well. Add tomato juice and a few ice cubes. Shake well to blend flavours. Pour into two garlic pepper rimmed shot glasses. 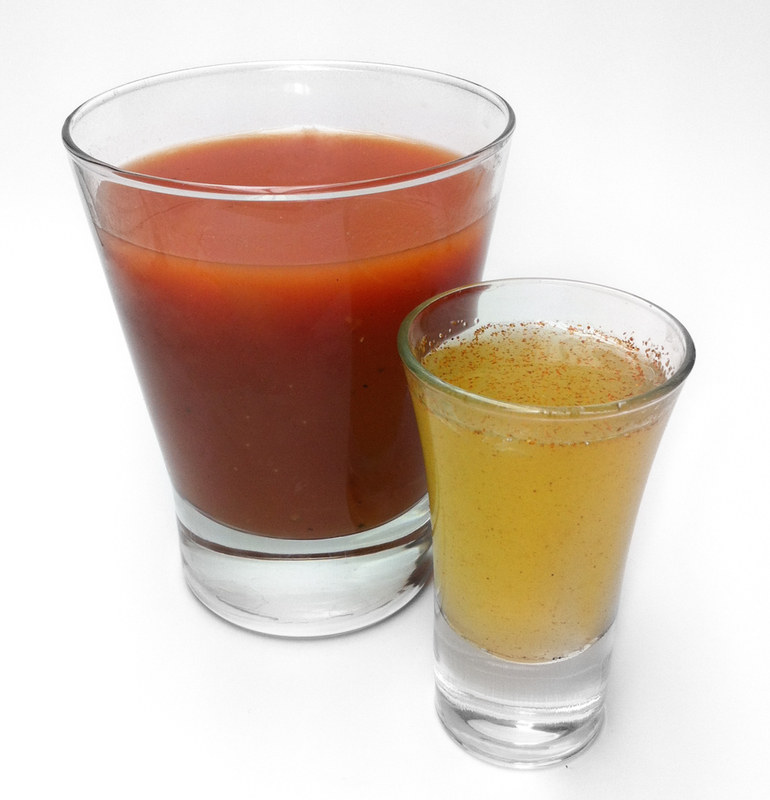 Mix on plate, line rim of shot glasses with lime juice and dip in Rimmer mix. While I am not a big fan of caesars, due to the degree of spice and Clamato, I have always loved tomato juice and becoming more enamoured with tomato juice based drinks. Kid-o-metre 1/5 Nope. Nope. Yep. Teens maybe, otherwise not a hit. Taste: 4/5 the pepper dimmer does give it a bite, the drink itself is very fresh tasting. Simplicity: 4/5 One special syrup to make, one easy Rimmer to dash together. Three Halloween Test Tube Shooters. From left to right: Snake Venom, Beetle Juice & Dragon’s Breath. Halloween approaches. In a week my two girls will be out in full costume knocking on doors and filling their bag with loot. For our family, halloween is about the dressing up and the spooky setting, about the fun of carving pumpkins and creativity. Our decor is based on real scary things: spiders, snakes and scarecrows and later closer to halloween, jack-o’-lanterns and if possible the fog machine going just outside the door. Being a mom of two girls has meant keeping the spooky and terrifying at bay, or be plagued with two small children with nightmares for weeks. Now that my eldest is maturing, she is able to differentiate real from imaginary, and is finding the world of myth and folklore fascinating. My youngest is asking for stories of elves, fairies, dragons and unicorns, and I am now the creator of magical tales in our home that both children are waiting to hear before bed. So for my first venture into Halloween drink making – I have chosen to blend a little of the real with a little of the imagined in these three test tube shooters. The idea came to make a snake venom as I was working through scary liquids commonly held in test tubes. In chatting with my local pharmacist and friend, she tells me that snake venom is actually being used now in medicine! I can’t say that my beverage will have any healing effects – but it does have a bite. Mix all ingredients in a cocktail mixer with a few ice cubes. 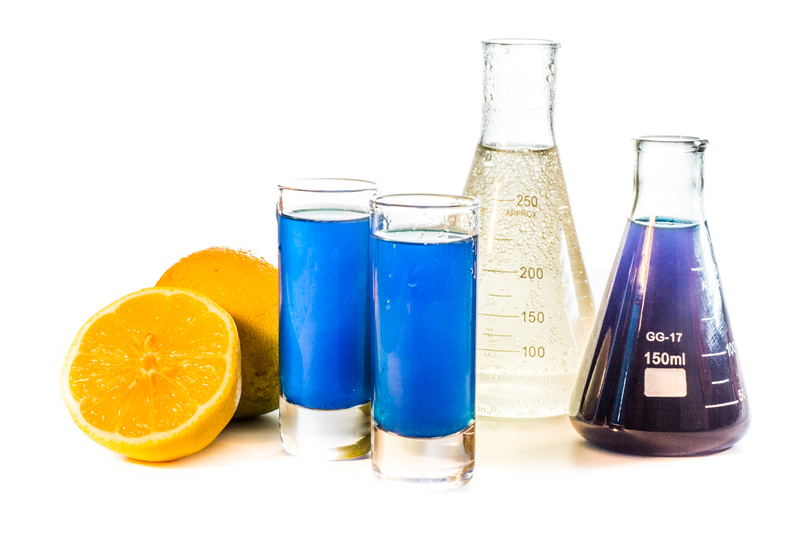 Shake well and strain into two 1 oz shot glasses or test tubes. Makes two 1 oz shots. My eldest daughter, niece and I love this drink. It is spicy, sour, bitter and sweet all at once. My youngest daughter isn’t sure what to think of it, and while my husband was willing to try it his comment was ” I wouldn’t choose it”. I originally found this recipe when working through blackberry lemonade options online. (Someday I’ll tell you all about that! Dole foods provided me with the recipe) This syrup recipe is pretty easy and super versatile. Because the sweet and spicy blend upon cooking, having this pre made is essential if you wish to add a peppery flavour to a sweet drink. Smash black pepper in a ziplock bag and add to pot with water and sugar. Bring to a simmer on medium high heat until all the sugar is resolved and for about 5 minutes more. Allow to cool and strain into a air tight container. Keep in fridge until use. the original recipe called for toasting the pepper corns before infusing them in the syrup. I had mixed peppercorns – red, green and black – and chose to leave them plain. I don’t know what the flavour would be like toasted, possibly darker? Next time I need some of this I will test that theory, but the plain version seems to work well for now. This was inspired by my youngest, as we wandered through the grocery isles wasting time before a job interview. Being that she’s huge into fairy creatures, and we had recently watched Shrek 3 for a “movie dinner night”, she suggested making a spicy drink. Originally she had hoped the drink would be called Dragon’s acid, however I pointed out that most dragon’s have hot breath – and this became acceptable. Coming up with the perfect drink for this became a challenge. Originally I purchased tomato juice, limes and jalepeno peppers, but my non spicy husband and kids made me start searching for alternatives. Being an Epicure fan, I immediately started searching for my red pepper jelly, and came across a secret stash of my friends habanero jelly, gifted to me almost a year ago. So with that as the starting point, I went back to the research to come up with fruits that paired with this ingredient. What I found was many ideas, all based on jellies, salsa and sauces. No prob! I can adapt that to a drink – sez I! So back to the kitchen, and to the fridge to pull out bottles of juice, specialty syrups and frozen juices I created earlier. In order to come up with the best combo I tried a number of ideas – mint, grapefruit and jelly; garlic, tomato juice, lime and jelly; cranberry, honey, sour mix and jelly; and finally raspberries. Of all the combos my family and my spicy loving in-laws tried, this is the one that rocked it! Muddle pepper syrup, red pepper jelly and fresh bell peppers in bottom of a cocktail mixer. Add 4-5 ice cubes and shake well. Add raspberry juice and shake to blend flavours. Strain into two shot glasses (1 oz each) or test tubes. Normally raspberry juice is so strong that it needs sweet to mellow it out. Incredibly enough, spicy will also do the trick! Who knew! Can’t wait to unleash this on my daughters, who were both in bed by the time I had this all figured out. I made my own raspberry juice – using frozen raspberries and blending them with water. In some locations you can get red raspberry juice easily, if so and it’s tart, go for it! In my town, not a possibility. you can find the recipe below. Kid-o-metre ?/5 will keep you posted, my niece who is a teen loved it. Taste: 5/5 wow even my hubby liked it! Simplicity: 4/5 One recipes to make. One ingredient to find. Ingredient finding: 5/5 Red pepper jelly can substitute, making this easy to find all the ingredients for if you have internet and a credit card. Heat berries in water to boiling. Turn down and simmer 10 minutes. Strain and press to get all juice out of berries. Add citric acid and stir to mix well. Store in fridge or pour into ice cube trays and freeze for later use. It is said that some beetles have orangish blood. Since this next drink blends the bite of habanero peppers with the sweetness of cranberry and orange, I thought the name fitting. One may say that all drinks named this should be black and white, or that if one asked three times for this shooter, some ghoulish creature will appear and make your life miserable (or is that the cat in the hat? ), so if you decide you want a third dose of this great halloween shooter – maybe ask for it by it’s scientific name: Coleoptera juice. Mix all ingredients in a cocktail mixer with 2-3 ice cubes. 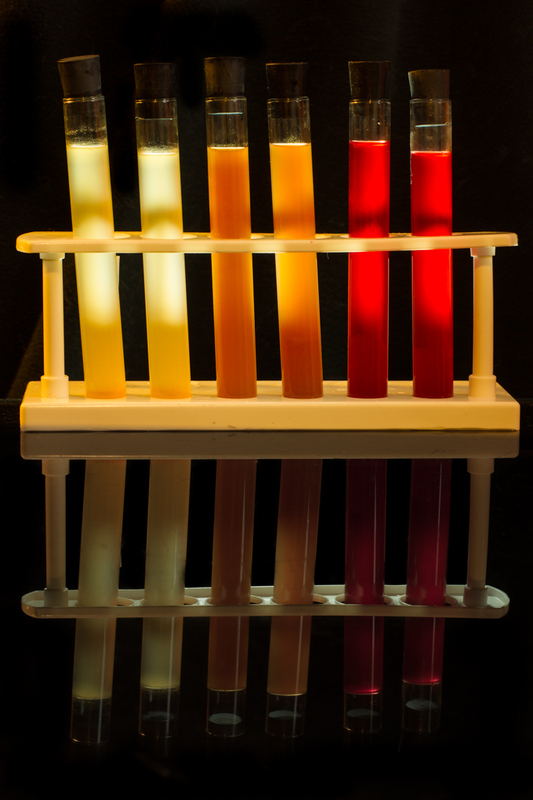 Shake well to blend in jelly, strain into two shot glasses (1 oz each) or test tubes. Habenaro Jelly is the key ingredient in this recipe, but I can’t tell you where to buy it because I am lucky enough to have a super jelly making friend who keeps me topped up every christmas. The one jar often lasts our “non-spicy” family for the full year. There are plenty of recipes for DIY habenaro jelly, I would recommend one that keeps to simple ingredients without any added flavouring components – like on Food52 or My Pantry Shelf. Epicure makes a decent red pepper jelly, that can substitute for the real thing in a pinch. My spice lovin’ niece and her mom both enjoyed this one. While I am not a fan of super hot flavours, this is a more gentle drink due to the sweetness of the cranberry. The spice is a slow burn that creeps up, so again if you have more than one… beware! Kid-o-metre 3/5 older kid drink, the sweetness hits first then the spice. Taste: 4/5 some in my family are not fans of spicy concoctions. what are your thoughts? Simplicity: 4/5 If you can find the jelly, it’s a cinch to make. Ingredient finding: 4/5 When I find the jelly anywhere other than in my kitchen, I’ll let you know where to buy it! Stay tuned for new halloween creations in next ten days!